Erich Krauss is a professional kickboxer who has lived and fought in Thailand. He has written for the New York Times and is the author of more than 25 books, including the New York Times Bestseller, Got Fight? 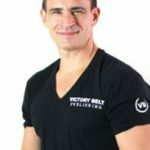 Krauss is the founder and publisher of Victory Belt Publishing. He lives Las Vegas.